For years, ever since it was first published, the Bardo Th�dol has been my constant companion, and to it I owe not only many stimulating ideas and discoveries, but also many fundamental insights. Thanks to C.G. Jung�s association with the pioneer Tibetan scholar, W.Y. Evans-Wentz, Jung wrote two major essays in the 1930�s discussing Tibetan Buddhism. Jung�s quotation above gives some sense of his appreciation of Tibetan Buddhism. Although Tibetan Buddhism strongly influenced Jung, it is hardly of the magnitude of such influences as alchemy. Nevertheless, a reading of these two essays reveals many rich connections between Tibetan Buddhism and Analytical Psychology. Tibetan Buddhism, especially the tantric expression of it, shares Analytical Psychology�s emphasis on imagination, dreams, synchronicities, attention to the feminine, and the importance of harnessing such potencies as sexuality in the transformation process. A limited literature has explored some of these connections. Today, because of the Tibetan Diaspora, there has been a torrent of Buddhist scholarship and personal teaching. Thanks to this output, many in the west are becoming aware of the vastness and profundity of the Tibetan Buddhist tradition. We are thus in a better position than ever to appreciate the relationship between Tibetan Buddhism and Analytical Psychology. Psychology accordingly treats all metaphysical claims and assertions as mental phenomena, and regards them as statements about the mind and its structure that derive ultimately from certain unconscious dispositions. It does not consider them to be absolutely valid or even capable of establishing a metaphysical truth. We have no intellectual means of ascertaining whether this attitude is right or wrong. We only know that there is no evidence for, and no possibility of proving, the validity of a metaphysical postulate such as �Universal Mind.� If the mind asserts the existence of a Universal Mind, we hold that it is merely making an assertion. We do not assume that by such an assertion the existence of a Universal Mind has been established. There is no argument against this reasoning, but no evidence, either, that our conclusion is ultimately right. In other words, it is just as possible that our mind is nothing but a perceptible manifestation of a Universal Mind. Yet we do not know, and we cannot even see, how it would be possible to recognize whether this is so or not. Psychology therefore holds that the mind cannot establish or assert anything beyond itself. There is little doubt about how powerfully archetypes condition our experience, both intellectually and affectively. 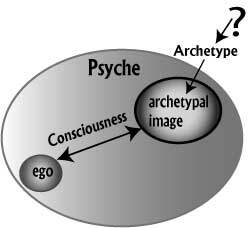 Figure 1 illustrates Jung�s view by designating the psyche, the conscious and unconscious whole, by a shaded ellipse. The question mark represents whatever transcendent principle exists outside the psyche. Archetypes, which also have a trans-psychic or psychoid nature, then express this transcendent principle in an archetypal image. Of course, it is impossible to differentiate the contribution of the archetype from that of the transcendent principle, since they are inextricably intertwined in the archetypal image. Finally, the relationship between this image and the ego generates consciousness. For Jung, all conscious experience must take the dualistic form of an ego relating to an image. The whole aim of the Bardo Th�dol teaching, as otherwise stated elsewhere, is to cause the Dreamer to awaken into Reality, freed from all the obscurations of karmic or sangsaric illusions, in a supramundane or Nirvanic state, beyond all phenomenal paradises, heavens, hells, purgatories, or worlds of embodiment. In this way, then, it is purely Buddhistic and unlike any non-Buddhist book in the world, secular or religious. From this nonduality perspective, there can be no second principle of any kind. There can be nothing outside or beyond the nondual to which it can be opposed, no oppositions within it, and no possible limitation of it. As Evans-Wentz stated, such a nondual state is, for the normal human intellect, �beyond comprehension,� because the normally functioning human intellect must always work with oppositions, as Jung always stressed. Nevertheless, nonduality is surely a pivotal aspect of the Bardo Th�dol and Tibetan Buddhism in general. Although there are deficiencies in the Evans-Wentz translations, more accurate translations along with modern scholarship on Tibetan tantra are clear about the nonduality at the heart of Tibetan Buddhism. Tibetan Buddhists would respond to Jung�s model of consciousness by noting that imaginal, conceptual, intellectual, symbolic, or inferential knowledge is like �a finger pointing at the moon,� as they say in Zen. All Buddhists want knowledge of the moon, not the pointing finger. They are quite clear about the need for direct, non-imaginal, non-conceptual, and non-inferential knowledge. Therefore, there is such emphasis on meditation, which can lead to direct knowledge�not the dualistic kind of knowledge where an image is in relationship to an ego. Yet, this divergence of views and the resulting impasse is more than an expression of Jung�s scientific agnosticism. It is one thing to say that because of the inevitable influence of archetypes we must remain noncommittal about ultimate principles and quite another to deny the possibility of such a principle. For example, it is empiricist caution to say, �I am agnostic about the existence of God.� It is denial to say, �The existence of God is impossible.� In a letter to Evans-Wentz, Jung moves beyond agnosticism to outright denial of the experience of rigpa, the indivisibility of the luminosity of knowing and emptiness [Sunyata]. In that letter Jung wrote, �Thus it is absolutely impossible to know what I would experience when that �I� [ego] which could experience didn�t exist any more. One calls this a contradictio in adjecto. To experience Sunyata is therefore an impossible experience by definition.� To deny the experience of emptiness in Buddhism is roughly equivalent to denying God in Christianity, since each principle is the center of that tradition�s intellectual formulation and the practice of that religion. Of course, if Jung denied the existence of God he would be pilloried, but his denial of the corresponding pinnacle of Buddhism in mid 20th century Europe goes unnoticed. When mind is explained from the point of view of the Highest Yoga Tantra teachings and the path of mantra, we find that many different levels or aspects of mind are discussed, some coarser and some more subtle. But at the very root, the most fundamental level embraced by these teachings is mind as the fundamental, innate nature of mind. This is where we come to the distinction between the word sem in Tibetan, meaning �ordinary mind� and the word rigpa signifying �pure awareness.� Generally speaking, when we use the word sem, we are referring to mind when it is temporarily obscured and distorted by thoughts based upon the dualistic perceptions of subject and object. When we are discussing pure awareness, genuine consciousness or awareness free of such distorting thought patterns, then the term rigpa is employed. Because nonduality and epistemology are such pivotal issues here, I will try to clarify these topics by developing an analogy between nondual mind and dreaming sketched by Anthony Damiani. This is not a psychological use of dreams as the �royal road� to the unconscious. Rather, it attempts to use dreaming to illustrate the essentially philosophic ideas of nonduality and the nature of the knowing subject. This approach provides us easy access to deep philosophic issues through analogies and images. Although it suffers from the weaknesses of all analogies, it still gives a useful overview of the topic. 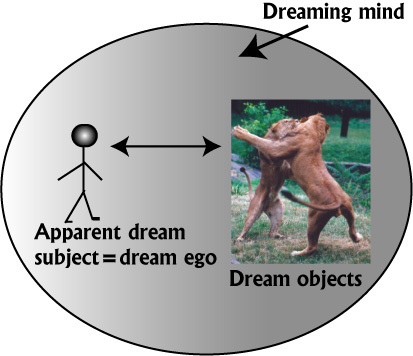 In Figure 2 below, the shaded ellipse with all its contents represents the totality of the dreaming mind. I distinguish four terms. First, there is the apparent dream subject or dream ego represented by the stick figure on the left�you who fears the lions in the dream. The dream ego is not the person who says, �I had a dream with two fighting lions.� That is the waking ego. Instead, as the dream ego you fully believe that you are the center of the dream action and the knower of the experience. Second, there are dream objects�the pair of fighting lions, the ground on which they fight, their roar, odor, and so forth. Third, there are the relationships between all the elements in the dream�your fear of the lions, their fierce fighting, the spatial and temporal relationships within the dream, and so forth. Finally, all the elements in the dream�the apparent dream subject or dream ego, the dream objects, and the relationships in the dream�are all productions, fabrications, or expressions of the dreaming mind. The dreaming mind is the intelligence that produces out of itself, as a spider spins its web, the entire dream with all its vibrant contents, their relationships, and action. Imagine that Jung appears in the dream and asks you as dream ego, �Is there another state, called the waking state, outside of this experience you are now having? One in which you can get away from these menacing lions?� Of course, any reference to anything outside the dream is just content within the dream. In other words, while in the dream, there is no possibility of contacting anything that is not a part of the dream. The dream is a totality, complete, self-contained, and with nothing opposing it. Thus within dream reality it is a nondual whole with differentiation within it. The dream ego cannot turn around and know the source of the dream. The dream ego cannot objectify and know as distinct from itself the very intelligence that is generating the dream along with the dream ego. In contrast, consciousness revealing contents or sem, is analogous to the dream ego�s functioning mind (the dream subject fearing the lions). Without special effort, this is the only mind most people know. The various objects in the dream, including the dream ego, are analogous to the objects known in waking consciousness by rigpa. Just as the dream ego cannot know the dreaming mind while in the dream, so we cannot know rigpa with or through sem. We cannot know rigpa as we know a pen, a pain, or a fantasy. We can only know rigpa by becoming it, by stopping all the motions and divisions of sem and merging into the ocean of rigpa. The goal of meditation is to slow down the conceptual functioning of sem until it can merge in its source�rigpa. Tibetan Buddhists maintain that you can get a conceptual understanding of rigpa, but even more importantly, directly experience it by shutting down the conceptual activity of sem and merging with this primordial ground, the pure pristine awareness or rigpa. As the quotation from the Dalai Lama below makes clear, this is not unconscious; experience continues but in an egoless mode. Similarly, we cannot know the dreaming mind by staying exclusively in the divided consciousness of the dream ego. Instead, we can only know the dreaming mind by breaking the dreaming mind�s identification with the dream ego. The following table summarizes the analogy between dreaming and rigpa. Once you go beyond the alaya [an unwavering state of consciousness, which does not grasp after objects], it is like someone lifting a heavy hat off his head: an extraordinary quality of rigpa comes to the fore. There is no inner and no outer, nothing like �this� or �that,� nothing to be experienced by something experiencing it, and no duality of subject and object whatsoever. Yet it is not some unconscious state, where you do not know anything, or never think of anything at all. This rigpa does not have to be sought the way that consciousness knows an object. It is as though all objects of knowledge, outer and inner, come back to and return within it, and this is the extraordinary state of awareness that will arise. The quotation referenced in endnote 9 from the Bardo Th�dol states that rigpa, or pure, pristine awareness is �in reality void� needs amplification. Emptiness or voidness is the pivotal principle within Tibetan Buddhism and it plays an important role in this essay. Emptiness asserts that all subjects and objects, no matter how rarified or refined are totally empty or void of independent or inherent existence. To understand this view, we need to define more fully this inherent existence being denied or negated. Inherent existence or independent existence is the property we naively and instinctively believe makes objects real. Using the term �objects� in the widest sense, we unreflectively believe that their reality is based upon their ability to exist on their own right, independent of the need for our knowing or the object interacting with other objects. Objects can certainly be known and they can interact with other objects, but we instinctively believe that their deep reality is their independence of knowing or interaction, their ability to �exist from their own side,� as the Tibetan say. For example, I have a pen in my pocket. This is a �real� pen that fully exists, whether known or unknown, in my pocket or yours, in contact with paper or not. Emptiness is the principle that all objects and subjects, pen or persons, are totally void or empty of inherent existence, or without any essence or independent identity. The standard language Tibetans use it to say that nothing is finable upon ultimate analysis. There are three main classes of arguments used to establish emptiness. Rather than review them here, I just consider the idea of inherent existence and see that, despite our belief in this cardinal �reality principle,� it is fraught with contradiction. For example, if something inherently existed then by its very nature it would be intrinsically independent of interacting with a knower or other objects. Because it would then exist in independence or isolation, its essence would never change nor be influenced by anything. Therefore, eternality is built into the definition of independent existence. Of course, this is not our kinetic world of change. Through such considerations, the Tibetan Buddhists show that the ultimate identity or inherent existence of a tree, a person, or an electron, which we assume underlies each phenomenon, is completely unfindable and nonexistent. In short, emptiness is the rejection of any reified notion of substantial reality. Yet, subjects and objects certainly have a conventional existence and can function to bring us help and harm, but their most fundamental truth is one of deep dependency and interconnection, as opposed to our na�ve and false view in their independent existence. Thus, ultimately all phenomena are empty or void of inherent existence and only exist as a complex series of dependencies and relationships. This is not nihilism, since the ultimate truth of emptiness actually allows phenomena to conventionally exist and function. In fact, emptiness itself, in that it depends upon the phenomena it characterizes, is empty and nondual. Clinging to the false notion of independent existence, we form all the attachments and aversions that always lead to suffering. For example, believing in the independent existence of our own personality we inexorably become selfish and fearful of death. Breaking through this false belief in independent existence frees us from the opposites and permits the cultivation of limitless universal compassion�the desire and resolve to relieve the suffering of all sentient beings. In fact, without a significant assimilation of the doctrine of emptiness it is not possible to cultivate genuine universal compassion. The ultimate goal of Tibetan Buddhism is to transcend all opposites and their concomitant suffering and to be aware simultaneously of the two truths, while practicing universal compassion. On one hand, the practitioner honors the relative truth that individuals are finite and well defined�the empirical person identified in the passport. On the other hand, in the ultimate truth of emptiness all subjects and objects are totally void or empty of independent existence or essence. Therefore, on the plane of relative truth, the enlightened Buddhist has a distinct and unique personality. She has a unique body-mind complex, historical identity, and passport with a distinctive number. Yet, from the side of ultimate truth, she is continuously aware of her emptiness and nondifference from rigpa, her total interpenetration and nonseparable connection to reality in all its effulgence and emptiness. The practice of universal compassion, the working toward freeing all sentient beings from suffering, naturally flows from such wisdom. Returning to the dream analogy, individuation is analogous to the dream ego developing a clear sense of its own unique and distinct nature. Then, through developing a symbolic mode of apprehension, the dream ego builds a relationship between itself and the intelligence being expressed as the entire dream. Following Jung�s injunction that the ego should never identify with the self, the dream ego maintains its differentiation from the dreaming mind, yet through the ongoing dialogue seeks to embody the wisdom of the more inclusive principle. Now a symbol is not an arbitrary or intentional sign standing for a known and conceivable fact, but an admittedly anthropomorphic�hence limited and only partly valid�expression for something supra-human and only partly conceivable. It may be the best expression possible, yet it ranks below the level of the mystery it seeks to describe. The symbol is thus always a �limited and partly valid� expression, well below the level of the mystery of the archetype itself (recall Figure 1 above). There is thus no direct contact with anything that could be said to independently or inherently exist. It may indeed be the �apotheosis of individuality,� but, if symbolically and properly understood, it need not be in conflict with the Buddhist principle of no-self. In fact, an appreciation of emptiness can help us avoid a reified and overly literal view of the self. However, if we look more generally at the role of archetypes in Analytical Psychology and Tibetan Buddhism we can appreciate a significant divergence between these two traditions. I am often asked: "Will the deities appear to a Western person? And if so, will it be in familiar, Western forms?" However, this point of convergence should not be misunderstood. For example, Jung always stresses the necessity of relating to the archetypes. However, he warns us, �The characteristic feature of a pathological reaction is, above all, identification with the archetype. This produces a sort of inflation and possession by the emergent contents, so that they pour out in a torrent, which no therapy can stop.� Although Jung stressed the importance of relating to the archetypes, of appreciating the mythic, archetypal dimensions of both our inner and outer lives, he repeatedly warns of identification with these autonomous powers. In particular, in active imagination, a technique for directly addressing the archetypal powers, we are always to avoid identification with the archetypal images that arise. For example, a main tantric technique is the cultivation of a subtle divine pride, a confidence that one is an enlightened tantric deity, the Lord of the Mandala. One's mind is the Wisdom Body of a Buddha, one's speech is the Beatific Body, one's form is the Perfect Emanation Body, and the world and its inhabitants are seen as a mandala inhabited by the various forms of tantric deities. Thus, we have to utterly change our sense of I. To do so involves the subject of emptiness. To prac�tice the yoga of divine pride without an understanding of emptiness will not only be useless, but could lead to iden�tity problems and other undesirable psychological effects. Therefore, it is said that although the Vajrayana [tantric practice] is a quick path when correctly practiced on the proper spiritual basis, it is dangerous for the spiritually immature. This type of danger area is one of the reasons why the Vajrayana must be practiced under the supervision of a qualified vajra acharya [master]. I have discussed synchronicity from the perspective of analytical psychological in two books and several articles. Here it is only necessary to affirm the central principle that synchronicity represents a simultaneous incarnation of meaning in both the inner and outer worlds. Jung views meaning as the sine qua non of synchronicity. He writes, �Although meaning is an anthropomorphic interpretation, it nevertheless forms the indispensable criterion of synchronicity.� A genuine synchronicity experience is thus always an important episode in a person�s individuation, in coming to be a unique, whole, and distinct individual. The primary intention of synchronicity is to manifest the archetype of meaning�the transformative intelligence of the self. Synchronicity is individuation in action and like any major episode of individuation, such as an important dream, the meaning or intent of the experience is not right on the surface. Ferreting out the meaning requires patience, a cultivation of symbolic consciousness, and alertness to the dangers of imposing convenient, but often misleading, analytical formulations on the experience. Despite his desire to avoid metaphysical assertions and his disclaimers about the certainty of such claims, Jung�s postulating of a unity underlying psyche and matter draws him closer to the Tibetan Buddhist unitary principle of rigpa. Although both Jung and Tibetan Buddhism would deny that they are idealistic views, meaning that mind is the only principle, they draw together in their mutual appreciation of the need for unity underlying multiplicity. This second feature, the direct intuition of the meaningfulness of a synchronicity experience, confirms, as noted above, Jung�s understanding of the centrality of meaning for synchronicity. However, the first point, the astonishment, according to the doctrine of emptiness, arises out of our false belief in the mutually independent existence of the world and ourselves. In other words, our amazement when a synchronicity occurs is an indication of just how much we believe in the mutually independent existence of the material world and our personality. In short, it is an indication of our ignorance of the empty nature of the world and self. Stated positively, synchronicity directly expresses the deep interconnectedness between the world and ourselves. These different approaches of Analytical Psychology and Tibetan Buddhism to synchronicity express their different orientations toward the personality undergoing the experience. For Analytical Psychology synchronicity experiences serve primarily to bring about a fuller expression of the self in our lives. In other words, in Analytical Psychology the self, the unique �apotheosis of individuality,� is more fully incarnated in the world via the process of individuation and hence through synchronicity. While in Tibetan Buddhism, the synchronicity experiences serve to confirm and illustrate the emptiness of both the world and the person. Of course, these different approaches to synchronicity are fully in keeping with the differences between individuation and Buddhist enlightenment. Many westerns have ignored Jung�s advice and taken up meditation in large numbers. Rather than try to understand this phenomenon, I unpack Jung�s warning against yoga as another way to clarify the distinction between Tibetan Buddhism and Analytical Psychology. Here is a simple example: I get powerfully angry with somebody. Because of the powerful affect, Analytical Psychology would advise me to investigate my shadow, see where it leads me, and perhaps unearth the activated archetype. Maybe my anger would generate a dream or fantasy, useful as a starting point for active imagination, where I might ferret out the intentionality of the experience. In such activity, we often need to keep the controlling ego in the background so that the images can develop freely. What does this anger tell about me? Perhaps even more important, where is the psyche trying to lead me? Psychologically we use the outburst of anger as a stimulus for reflection and building awareness. Here the images guide us and we cultivate a feeling-intuitive approach toward them. Tibetan Buddhism on the other hand, recommends willfully applying an antidote�to respond vigorously with compassion, equanimity, and recollection of our deep interdependence or emptiness. Here we are not being guided by images, or following Ariadne�s thread, but destroying the negative ones and willfully replacing them with compassionate substitutes. Analytical Psychology advises us to take a meandering, feeling-intuitive approach to letting the psyche guide us to the fullest expression of our individuality. This is diametrically opposed to the rigid disciplining of mind required in Tibetan Buddhism, which seeks not a unique expression of our individuality, but our Buddhahood�freedom from the opposite and universal compassion. Will Tibetan Buddhism lead to �cramping� and �stultification� of our �Western intelligence?� If wrongly applied, Jung�s concerns could be realized. However, we all tend to believe in the experiences with which we are most familiar. It is clear from Jung�s writings and recent biographies that nondality was not a big part of his life. Although he was an extraordinary articulator of the unconscious and graced by an astonishingly rich set of dreams, visions, and synchronicities, there is no suggestion that he experienced the nondual states that he repeatedly dismisses in his treatment of Tibetan Buddhism. However, Jung�s dismissal of nonduality expresses more than a lack of personal experience. It expressed his commitment to the scientific-empirical method. Proof or evidence for nonduality are ruled out by the very philosophic presuppositions of science, such as the need for objectivity, underlying this method. C.G. Jung, �Psychological Commentary on The Tibetan Book of the Dead,� Psychology and Religion, Collected Works, Vol. 11 (Princeton, NJ: Princeton University Press, 1969) p. 510. C.G. Jung, �Psychological Commentary on The Tibetan Book of the Great Liberation� and �Psychological Commentary on The Tibetan Book of the Dead,� Collected Works, Vol. 11 (Princeton, NJ: Princeton University Press, 1969). H. Coward, Jung and Eastern Thought (Albany, NY: State University of New York Press, 1985); D.J. Meckel & R.L. Moore, editors, Self and Liberation (New York, NY: Paulist Press, 1992); R. Moacanin, Jung�s Psychology and Tibetan Buddhism (London, UK: Wisdom Publications, 1986); R. Preece, The Alchemical Buddha (Devon, UK: Mudra Publications, 2000). C.G. Jung, �Psychological Commentary on The Tibetan Book of the Great Liberation,� p. 476. C.G. Jung, �Psychological Commentary on The Tibetan Book of the Great Liberation,� p. 484. H. Coward, �Jung�s Commentary on The Tibetan Book of the Dead� in Self and Liberation, edited by D.J. Meckel and R.L. Moore (New York, NY: Paulist Press, 1992) pp. 262-3. C.G. Jung, �On Physic Energy,� Collected Works, Vol. 8 (Princeton, NJ: Princeton University Press, 1978) p. 59. C.G. Jung, �Transformation Symbolism of the Mass,� Psychology and Religion, p. 207. C.G. Jung, �Psychological Commentary on The Tibetan Book of the Great Liberation� and �Psychological Commentary on The Tibetan Book of the Dead,� pp. 518-520. C.G. Jung, �The Phenomenology of the Sprit in Fairytales,� Collected Works, Vol. 9,1 (Princeton, NJ: Princeton University Press, 1977) p. 351. V.N. Mansfield, "Distinguishing Synchronicity from Paranormal Phenomena: An Essay in Honor of Marie-Louise von Franz, Part 1" Quadrant, Vol. XXVII:2, Summer 1998. Part 2 of this article is in the following issue. C.G. Jung, �Synchronicity: An Acausal Connecting Principle,� The Structure and Dynamics of the Psyche, Collected Works, Vol. 8 (Princeton, NJ: Princeton University Press, 1978) p. 485. C.G. Jung, �On the Nature of the Psyche,� Collected Works, Vol. 8 (Princeton, NJ: Princeton University Press, 1978) p. 215.